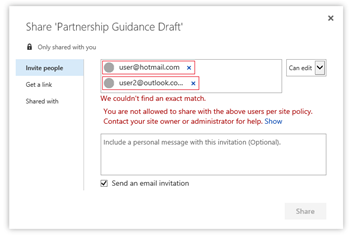 With SharePoint Online you can share a site with users from specific domains by using the restricted domains setting. This is useful for a business-to-business extranet scenario where you want to limit sharing with a particular business partner. Administrators can configure external sharing by using either the domain allow list or deny list. This can be done at the organization level or the site collection level. Administrators can limit sharing invitations to a limited number of email domains by listing them in the allow list or opt to use the deny list, listing email domains to which users are prohibited from sending invitations. Organization-wide settings affect all SharePoint Online site collections, including the OneDrive for Business site collection. In the left pane, select sharing. Under Additional settings, select the Limit external sharing using domains check box. From the drop-down list, choose either Don't allow sharing with users from these blocked domains to deny access to targeted domains or Allow sharing only with users from these domains to limit access to only to the domains you list. List the domains (maximum of 1000) in the box provided, using the format domain.com. If listing more than one domain, separate each domain with a space or a carriage return. Wildcards are not supported for domain entries. You can also configure the organization-wide setting by using the Set-SPOTenant Windows PowerShell cmdlet. In the case of conflicts, the organization-wide configuration takes precedence over the site collection configuration. If an organization-wide allow list is configured, then you can only configure an allow list at the site collection level. The site collection allow list must be a subset of the organization's allow list. If an organization-wide deny list is configured, then you can configure either an allow list or a deny list at the site collection level. For individual OneDrive for Business site collections, you can only configure this setting by using the Set-SPOSite Windows PowerShell cmdlet. On the site collections page of the classic SharePoint admin center, select a site collection, and then select Sharing. Under Site collection additional settings, select the Limit external sharing using domain check box. List the domains (maximum of 60) in the box provided, using the format domain.com. If listing more than one domain, separate each domain with a space or a carriage return. To configure the site collection setting for site collections that do not appear in this list (such as Group-connected sites or individual OneDrive for Business site collections), you must use the Set-SPOSiteWindows PowerShell cmdlet. Sharing content with email domains that are not allowed. If you attempt to share content with an external user whose email address domain violates your restricted domains settings, an error message will display and sharing will not be allowed. 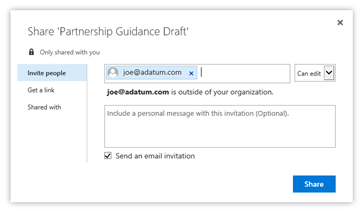 Sharing OneDrive for Business files to email domains that are not allowed. 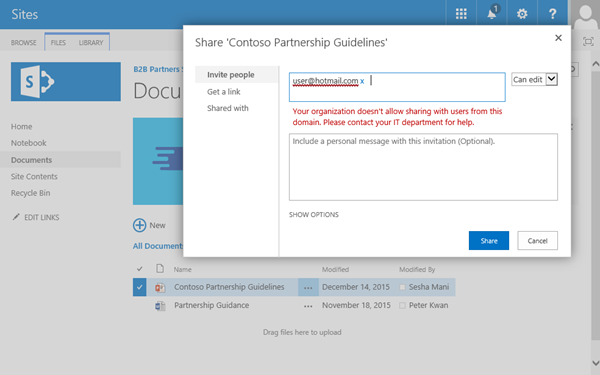 If you try to share a OneDrive for Business file with an external user whose email domain is not allowed as a result of your restricted domains configuration, an error message will display and sharing will not be allowed. Sharing content with email domains that are allowed. If your end user is attempting to share content with an external user who has an email address domain that is allowed, they will be able to successfully share the content with that external user. A tool tip lets you know that the user is outside of their organization. As with any extranet sharing scenario it's important to consider the lifecycle of your guest users, how to audit their activity, and eventually how to archive the site. See Planning SharePoint Online business-to-business (B2B) extranet sites for more information.